This is an Internal Ribosome Entry Site (IRES) acting in mammalian cells. It allows translation initiation in the middle of an RNA strand which is required for the fuctioning of our replicon as there are multiple protein coding regions separated by structural nucleotide sequences interspersed throuhgout the RNA strand. We chose to investigate two IRES sequences to compare the relative efficiency and determine which was better for incorporation into our system. These were the Encephalomyocarditis virus (EMCV) and the IRES derived from the NF-kappaB repressor factor (NKRF) untranslated region. <NKRF is a transcriptional repressor protein that is essential in the immune response and acts to mediate the translational efficiency of other cellular proteins. The IRES used in this experiment is dervied from the 3' untranslated region of the protein mRNA. 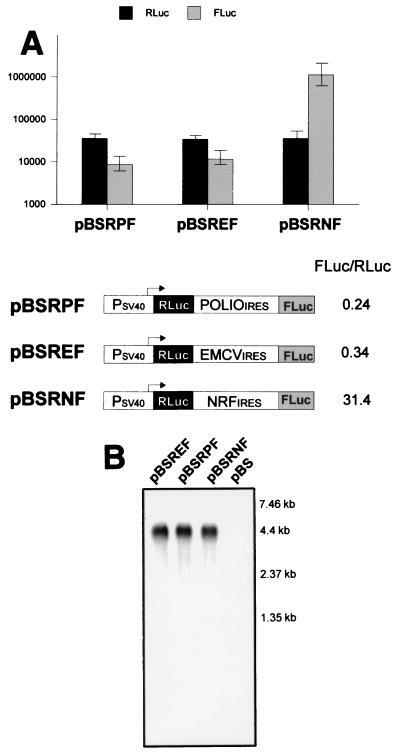 Oumard et al (2000) showing that the flourescence when using an NKRF IRES before a firefly luciferase protein was significantly higher relative to both EMCV and poliovirus IRES and hence seemed optimal for our system where translational efficiency is key to maintaining the replicon in the cell. This shows the secondary conformation of this structural nucleotide sequence and acts to attract ribosomes to the site of the start codon of the internal protein and begin translation. This IRES was intended for used before the neomycin selectivity marker and the NS5B RdRp derived from the HCV strain 1b genome, as both of these proteins are integrated into the RNA strand with structural nucleotide sequences before and after. This testing module was used to determine the efficacy of the IRESes by measuring the fluorescence in human HeLa and Huh7.5 cells using a tecan plate reader. The IRES was cloned between the AscI and BsrGI site following the T7 promoter and before the GFP. This was sequenced to ensure no mutations during the PCR amplification of the parts synthesised by IDT. We compared efficiency of EMCV and NKRF in both HeLa and Huh 7.5 cells. EMCV and HeLa have been previously investigated in HeLa cells however have not been directly compared in Huh 7.5 cells. We compared each of these at the peak of fluorescence for most of the cells, 1800 seconds after loading. Due to the nature of the measurement equipment we were unable to supply CO2 to the cells during measurement and the cells gradually died during the 25 hour measurement period explaining the exponential decline in fluorescence.
. Flourescence of the media and cells themselves were also taken into account. Each IRES had 10 biological repeats in each cell while the control had 5. Technical repeats were very difficult to achieve as it required splitting of the cells in each well as both HeLa and Huh 7.5 are attached cells, therefore the likelihood of spillage and contamination between the wells was too high to warrant the added accuracy of technical repeats. The fluorescence of each type of transfected cell was taken at 1800 seconds and averaged across the groups while fluorescence was adjusted for media and cell alone fluorescence and consolidated in this table. This clearly indicates that the NKRF IRES is significantly more efficient at initiating translation of GFP following this IRES conferring 2.4 times greater intensity than EMCV. Strangely the negative control showed higher fluorescence than the EMCV IRES also. This may have been due to increased growth rate of the cells or slower depletion of the growth media hence increasing overall fluorescence. Due to time restraints and limited number of wells in the plate we did not have as many replicates with this control.It may also be due to inefficient transfection of the cells with EMCV DNA strand. This is, to our knowledge, the first investigation of NKRF relative efficiency in Huh 7.5 cells. The results indicated that the NKRF IRES would be more efficient for use in our replicon but is conferred a less significantly increased relative fluorescence intensity than in HeLa cells as seen in the bar chart below. This bar chart indicates that the results of the IRES efficiency in Huh cells is not significantly different as the standard error bars overlap somewhat. The negative control, as in the HeLa cells, indicates that NKRF does work efficiently and significantly in HeLa cells.